As the government shutdown has furloughed the vast majority of the nation’s public health officials, it may not be any easier to trace the salmonella strain. 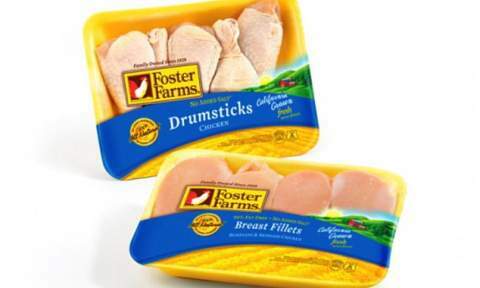 On Monday night – Oct. 7, the U.S. Department of Agriculture (USDA) and the Centers for Disease Control (CDC) issued a public health alert for raw chicken packaged in California. The chicken has been linked to nearly 300 salmonella cases across 18 different states, a widespread outbreak that appears to have begun in March. According to a spokesperson from the USDA’s Food Safety and Inspection Service, investigators have “had a difficult time pinpointing the source of the illnesses.” And now, as the government shutdown has furloughed the vast majority of the nation’s public health officials, it may not be any easier to trace the salmonella strain. As NBC News reports, the USDA and CDC can’t provide many details about the latest outbreak “because of limited staffing caused by a week-long government shutdown.” So far, the two agencies do know that the chicken in question was packaged at three facilities owned by Foster Farms, the same company that was the source of a different salmonella outbreak earlier this year. They believe it was mainly distributed to outlets in California, Oregon, and Washington state — but they haven’t yet been able to pinpoint the strain to a particular product or a specific time period. State health officials in California are still able to work, and are encouraging residents to make sure they’re fully cooking their chicken in order to kill potential bacteria. But the CDC, which typically monitors multi-state outbreaks of food poisoning, has been forced to scale back to a “skeletal crew” during the current shutdown. All but two of the CDC’s health officials who typically analyze foodborne pathogens have been furloughed. Wired notes that CDC officials couldn’t help track the current salmonella outbreak — which involves analyzing microbes in an attempt to link cases that occurred states apart — even if they wanted to. Scientists have been locked out of their offices, labs, and email accounts. The current shutdown is already one of the largest and longest in history, and it’s also coinciding with the beginning of flu season — another one of the CDC’s multi-state tracking efforts. On Tuesday afternoon – Oct. 8 – , CDC officials confirmed that some furloughed staff are coming back to work to help with the salmonella outbreak. Nearly a dozen people who typically work on foodborne analysis and outbreak response are now allowed to do their jobs again. “Now that we’re into our second week, we have to consider the possibility of this being a longer-term shutdown. We’re reevaluating some of the roles,” a CDC spokeswoman explained, saying that the low staffing levels have “come to a head” in the agency’s foodborne illness department. About 9,000 of the CDC’s 13,000 workers remain furloughed.